Do you want to buy a house or a piece of Star Wars history? Would you like a Ferrari or the DL-44 Blaster that Harrison Ford used? A college education or a toy gun? The answer is obvious right? It's Han Solo's DL-44 Blaster every time. 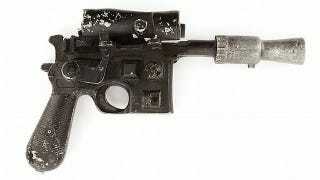 The blaster pistol made famous by Han Solo is up for auction and it's expected to fetch more than $200,000. Let's pool our money guys. This non-firing blaster was created for The Empire Strikes Back and was also used in Return of the Jedi. It would have been used in the majority of scenes that feature Han, with the heavier, live-fire weapon being used for close-up shots. Particularly noteworthy scenes requiring this lighter version are when Darth Vader uses the Force to lasso the blaster out of Han's hand in Empire, and in Jedi when Han wrestles with a Stormtrooper to regain possession of his blaster during the Rebels' encounter with Imperial forces on Endor. There are no bids right now for reasons I don't understand.